Which of These Puppy Bowl Contestants Will Make Your Fantasy Team? This year, Animal Planet is pulling out all the stops for Puppy Bowl X. The tenth-anniversary extravaganza promises penguin cheerleaders, canine first responders singing the National Anthem, and special appearances by Lil Bub and Keyboard Cat, who will be performing a piano-filled rendition of Bruno Mars’ “Locked Out of Heaven” during the kitten halftime show. And that’s not all — @meepthebird will tweet hilarious commentary from the sidelines. Of course, your own pup will be glued to the screen to watch all the action and help pick the Most Valuable Puppy (MVP). Submit a photo of your spirited pup on Instagram with #puppybowl for a chance to see him on TV. Best of all, continuing the tradition of showcasing adoptable pets, all the puppy players are up for adoption or have already found forever families. We’re hoping that the pups are watching themselves on TV from the comfort of their new homes. The main event starts at 3 p.m. EST on February 2 on Animal Planet. But don’t worry, if you’re too busy preparing for, you know, that other big sports event, you can still catch five other broadcasts of the Puppy Bowl. Each of the six shows will feature the same puppies and much of the same action, but each will have a certain amount of original footage, plus, viewers can vote on the MVP of each airing. As you wait for the most anticipated event of the season, check out the starting lineup of some of our favorite Puppy Bowl players. 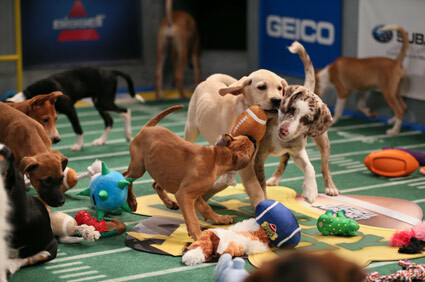 And be sure to head to the Animal Planet site later this month to create your own Puppy Bowl fantasy league. Out of 11 all-star puppies, participants will be able to pick a fantasy team of three players. Fun Fact: Feels Labs get a bad rap about shedding. Fun Fact: Wants to follow the band moe. across the country. Fun Fact: Has a crush on a fireman. Fun Fact: Thinks Mozart is overrated. Fun Fact: One day wants to own his own dog house. Fun Fact: Thinks fatherhood has mellowed Kanye. Fun Fact: Loves New Orleans jazz. Fun Fact: Counting sheep automatically puts her to sleep. Fun Fact: Thinks Seabiscuit is a fish-flavored dog treat. Fun Fact: Wants to catch a ride on one of those NASA Mars rovers. Fun Fact: Tries not to step on her own ears. Fun Fact: Favorite director is Paul Feig. Fun Fact: Thinks they should cut Miley Cyrus some slack. Fun Fact: Learned to waterski from a squirrel.